With GSA URL Redirect PRO, you can easily get short links for long URLs, including for multiple items at the same time. The shortened URLs automatically redirect to the original links. In the plain UI, you can enter the web address you want to shorten, and the resulted short link will be displayed in the lower panel. There’s also a settings menu for configuring the app, where you can choose if you want to use multiple or single links. To begin with, you need to input your link into the indicated field and optionally add one or more keywords, or import them from a TXT file. The drop-down menu enables you to choose whether you want to use one or several URLs. From the same location, you can validate your URL list or change the number of threads. Moreover, you can filter your results by link type and show only the ones which include your keyword. 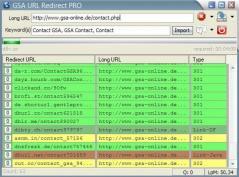 GSA URL Redirect PRO can work in recursive mode and you can even resort to proxies. After generating the short links, you can view each one’s rank and copy all the results or only selected records to your clipboard. At the same time, the program allows you to save the links to your computer, to a text file, for further use.